The CAUSE Annual Gala is the premier event for those interested in politics and community and boasts the largest attendance of APA elected officials. Attendees came together to celebrate the achievements of CAUSE and recognized those who have advanced the needs of the APA community. The gala also served as the largest fundraiser of the year for the organization. Funds raised will support the organization’s many programs and services, which include non-partisan voter outreach, training, and education as well as leadership development programs. The theme for this year was “The Time is Now.” The Asian Pacific American community is the fastest growing population in the United States, but remains severely underrepresented. As our country enters a new era of politics, it is important, now more than ever, to mobilize and empower our community, to make an impact in future elections. We want to ensure that the many voices in our communities are being heard. The evening kicked off with an energetic performance from Dan “DANakaDAN” Matthews, featuring his tracks “Runners” and “Stuntman” to get the audience excited for the night and empowered to participate in the 2018 elections. Following his performance, The Honorable Alex Padilla, California Secretary of State and the Master of Ceremonies, welcomed guests to a night of celebrating CAUSE’s 25 years in empowering the APA community. He spoke of the great partnership between the state and CAUSE in encouraging higher voter participation. Following opening remarks, CAUSE presented the “CAUSE at 25” short documentary, produced courtesy of East West Bank. The video included remarks by local elected officials and highlighted CAUSE’s history and vision for the future. 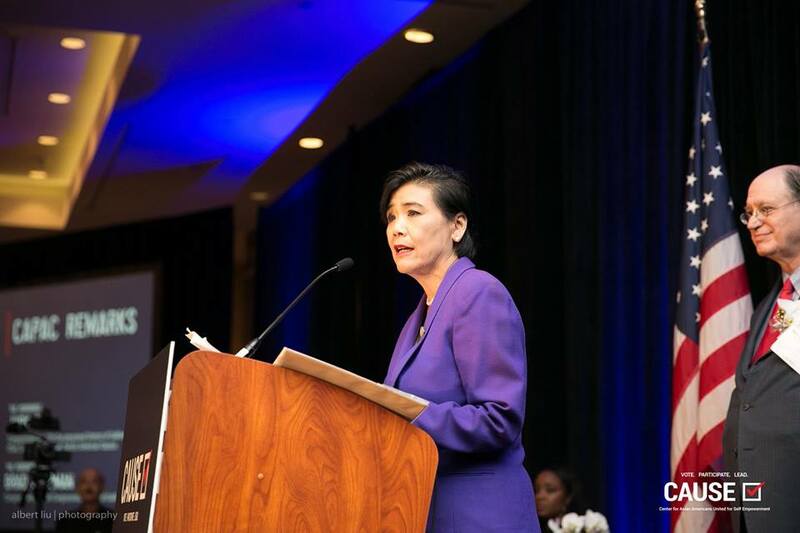 As representatives of the Congressional Asian Pacific American Caucus (CAPAC), Congressmember Judy Chu and Congressmember Brad Sherman provided remarks on how far the APA community has come in terms of representation in elected office. Congressmember Chu also presented CAUSE with a Congressional Record that will forever be displayed in the halls of the US Capitol. Afterwards, CAUSE Board Chair Charlie Woo shared with the audience the history of CAUSE and how CAUSE was first founded in 1993 as a way to better support APAs running for elected office. Since then however, CAUSE has expanded to empower the APA community to take on leadership roles not only in elected office, but to also hold leadership positions across a variety of industries and sectors. CAUSE emphasizes the importance of political and civic-minded leadership across all leadership roles. CAUSE then presented its 2018 Voter Engagement strategies in a video produced by Christopher Duong. CAUSE Board Members Adam Ma and Nita Song invited attending CAUSE board members, sponsors, elected officials, and nonprofit leaders to the stage for the annual Portrait of Power to document the community’s growing civic leadership and power. As representatives of the California Asian & Pacific Islander Legislative Caucus (APILC), Assemblymember Rob Bonta, Assemblymember Evan Low, and Assemblymember Ed Chau spoke on the importance of the continuation and growth of APA civic engagement. Next, City of Los Angeles Deputy Mayor of Economic Development Billy Chun took to the stage and introduced Ming Hsu, Trustee of the JT Tai & Company Foundation. As one of CAUSE’s greatest sponsors, Ming Hsu shared how valuable it is for her and future generations to have a community of powerful APA leaders. Ms. Hsu and the JT Tai & Company Foundation’s support has allowed for CAUSE’s transformational growth and has allowed CAUSE to provide more voter engagement programs. To celebrate 25 years of empowering the APA community, CAUSE selected 25 of its outstanding alumni to spotlight from across its leadership development programs. Alumni spotlighted were invited to the stage and presented with certificates of recognition from CAUSE. Thank you to all sponsors and supporters for making the CAUSE 25th Annual Gala a great success. Together, CAUSE commits and looks forward to many more years of empowering the APA community through leadership development and voter engagement programs!